Manchester City Council have an entire section of their website devoted to environmental problems, and to abandoned vehicles in particular, with the option to report a neighbour or any city resident for simply abandoning a car on the street. This can be done directly to the council via their website, or even by calling the non-emergency police number on 101, which highlights the severity of abandoning a vehicle in this way. But Manchester motorists could be missing a trick, because where there’s metal, there’s brass – at least where scrap cars are concerned. At J Davidson Scrap, we offer a free collection service to take your vehicle away, and that might already sound like a good way to get rid of the scrap cars Manchester drivers might otherwise abandon. Our commitment goes beyond just getting these abandoned vehicles off the streets, of course, as we carefully recycle as much of the car as we can, while disposing safely of some of the potentially harmful components like the engine fluids, battery acid and the rubber on the tyres. 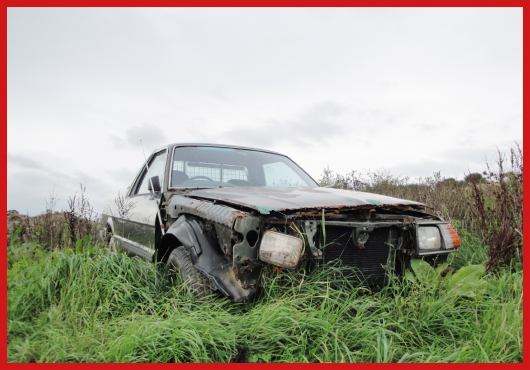 We can deal directly with the DVLA and issue you with the paperwork to show that your car has been scrapped, so if the police come knocking after an abandoned vehicle report, you have the proof that your car has been collected for scrapping. If you want to find out more about our car scrapping service, take a look at our website, where you can enter your vehicle’s details and condition in order to get a quote of how much it might be worth as scrap metal. There’s lots of information about what we do to your vehicle after we collect it – and even a video to give you more insight into the end-to-end process we offer. Remember, your car does not have to be at your own home in order for us to collect it – we can pick up vehicles from the roadside too, anywhere in the North West region. So if your once pride and joy is now a rusting heap of junk that hasn’t moved in months, make sure you act to have it safely and legally collected, before you find yourself on the receiving end of an abandoned vehicle report from a nearby resident.